This booklet was commissioned by the Victorian Government when the 525 metre long William Barak footbridge was built in 2006, connecting Birrarung Mar on the Yarra riverside to the MCG Stadium. A true Aboriginal leader and hero, this booklet tells his incredible story clearly and simply. It includes many photos and illustrations of his artwork and would be ideal for students. 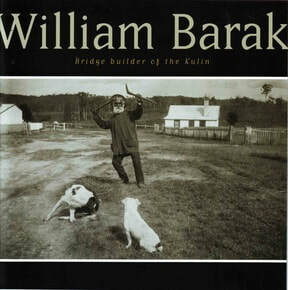 Born near the Yarra, Barak was present when Tasmanian pastoralist John Batman rowed up the Yarra River into history, beginning a traumatic series of events that was to forever change the Kulin’s way of life. As a boy, Barak was a witness to Australia’s first and only attempt to create a treaty between European settlers and Aboriginal clan leaders. Sixty-five years later at the turn of a new century, William Barak was the most famous Aboriginal person in Victoria. He had led his people to a land they could call their own at Coranderrk near Healesville. As a politically astute Kulin leader and an artist painting about Aboriginal subjects in a European style, he was one of the few Aboriginal people to have an impact on public consciousness in the nineteenth century. Lionised by Melbourne’s press as ‘King of the Yarra Tribe’, he had become a bridge between the new arrivals and the original Aboriginal inhabitants. Naming a bridge by the Yarra River after William Barak is a fitting tribute. This, after all, was once the land of his people, and he played a crucial diplomatic role in ensuring the Kulin retained a foothold within their territory well into the 20th century.